Like the main games, Pokémon in Pokémon GO have got Individual Values in their stats, these run from 0 to 15 with 15 being the best. This is also used in the calculation of Combat Points. Before Version 1.5, if you wanted to check the IVs of your Pokémon you had to do ridiculous calculations or give access of your account to third parties, which was not wise. However, in this new version, they added a new feature which allows for you to ask your team leader to appraise the Pokémon . 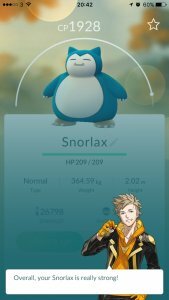 They will tell you about the IVs when added together into percentage, as well as give you a comment on the best stat of your Pokémon . 80%-100% Overall, your Pokémon simply amazes me. It can accomplish anything! Overall, your Pokémon is a wonder! What a breathtaking Pokemon! Overall, your Pokémon looks like it can really battle with the best of them! 65%-80% Overall, your Pokémon is a strong Pokemon. You should be proud! Overall, your Pokémon has certainly caught my attention. Overall, your Pokémon is really strong! 50%-65% Overall, your Pokémon is a decent Pokemon Overall, your Pokémon is above average. Overall, your Pokémon is pretty decent! 0%-49% Overall, your Pokémon may not be great in battle, but I still like it! Overall, your Pokémon is not likely to make much headway in battle Overall, your Pokémon has room for improvement as far as battling goes. 15 I'm blown away by its stats. WOW! Its stats exceed my calculations. It's incredible! Its stats are the best I've ever seen! No doubt about it! 13-14 It's got excellent stats! How exciting! I am certainly impressed by its stats, I must say. Its stats are really strong! Impressive. 8-12 Its stats indicate that in battle, it'll get the job done. Its stats are noticeably trending to the positive. It's definitely got some good stats. Definitely! 0-7 Its stats don't point to greatness in battle. Its stats are not out of the norm, in my opinion Its stats are all right, but kinda basic, as far as I can see.